Conjuring Moods from the BIG TOP to the BOUDOIR. Guaranteed to leave your HEAD spinning and BODY twitching. These Intrepid Musicians soulfully skew Crooked Originals and Twisted Standards that run the gamut from the Dark to the Comical, the Bashing to the Sublime. This CD is a Circus of Music, with World-Reknowned players of Jazz, Funk, Appalachian, Latin and World music, destined to lead audiences over mountains of musical mayhem with virtuosic bravado, grand humor and technical wizardry. 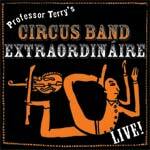 Professor Terry's Circus Band Extraordináire was honed over three seasons (2001-2004), and features a cast of band leaders who bring their musical genius and humor to an exceptionally soulful performance. The live show includes a world class contortionist, silly dancing, sight gags and other added adventures. This release captures the breadth and energy of live performances in San Francisco, 2002. A wild, woolly-headed, brilliantly spotlit circus dream of music that not only swats the senses but stirs the soul.